The art of art lending, and how it is changing in Braddock, PA.
At the Carnegie Free Library in Braddock, Pa., you can borrow a painting instead of a paperback. The library's Art Lending collection comes from an astonishing variety of sources, including local painters and collectors, students in Hunter College's MFA program, inmates from a nearby prison, and nearly all of the 35 artists featured in the 2013 Carnegie International exhibition in Pittsburgh. The Art Lending project began as a collaboration between the Braddock Carnegie Library Association and Transformazium, an artist collective dedicated to recognizing "artistic and intellectual discourses that use other languages than those of art systems and institutions," according to their website. Since 2009, Transformazium has been working to revitalize Andrew Carnegie's once-neglected 19th century landmark through a series of multifaceted creative projects – including a screen-printing shop, a ceramics studio, and a residency program featuring local artists. On April 9 at 4:30pm, the three women who make up Transformazium (Dana Bishop-Root, Ruthie Stringer, and Leslie Stem) will discuss the Art Lending collection – as well as their larger commitments to socially engaged art-making – in the beautiful Metzgar lobby at Penn State Erie, The Behrend College. When viewing the diverse collection in the Art Lending program, interesting juxtapositions emerge. When I visited the library in February, one of the display racks featured a framed poster of Malcolm X hanging above an original photograph by British multimedia artist Sarah Lucas. The reproduced image of the African American activist would probably sell for about $35. By contrast, a Sarah Lucas sculpture from the mid-'90s was recently purchased for $62,500 at Sotheby's auction house. Both works are available for checkout to anyone with a valid library card in Allegheny County, Pa. These combinations aren't intended as an art-world prank – they're meant to encourage local dialogues about commerce, taste, and cultural capital. To oversee the project, Transformazium used funding from the Heinz Endowment Program to create three paid positions for Art Lending facilitators from the local community. The facilitators notify the community about the collection, help patrons choose works from it, and take part in the curatorial process that leads to new acquisitions. The Art Lending collection drew plenty of local and national attention when it was featured in the 2013 Carnegie International exhibition in Pittsburgh. In fact, shortly after the show, arts facilitator Mary Carey received a letter from Richard Guy, an inmate at the nearby State Correctional Institute – Fayette, state prison, who had read about the lending program in a newspaper. Guy had spent years gathering an impressive collection of artworks from his fellow inmates, which he was eager to share with the library. This led to the Prism project, which eventually collected more than 80 submissions from artists serving long sentences at the prison. Carey kept an open mind as she began the curatorial process: "I didn't look at them as inmates; I looked at them as artists." The Prism project resulted in an exhibition at the library featuring work produced by 17 artists in Richard Guy's cellblock. According to Carey, the inmates used "anything and everything" to make the work, including bedsheets, pillowcases, toothpaste tops, and wooden spoons. The exhibition recently traveled to the Carnegie Library's Oakland location. When it returns to Braddock, it will be made available through the lending program as well. If the name "Braddock" sounds familiar, that's probably because artistic innovation is becoming synonymous with the small town, which is located about ten miles east of Pittsburgh. Since 2005, eccentric mayor John Fetterman has prioritized creative labor as a way to revitalize its struggling economy. Over the past decade, a network of small businesses, nonprofits, DIY enthusiasts, artists, and local activists have come together to make the town more vibrant. When I spoke to Dana Bishop-Root about Braddock's much-hyped renaissance, she was understandably resistant about what she calls "the exported narrative" about the town. Too often, Braddock's transformation has been described in patronizing Wild West terminology – it's the abandoned ghost town that was rescued by "pioneering" millennials in search of cheap rent and artistic freedom. By contrast, when Transformazium arrived in Braddock in 2007, they discovered that its creative community extends far beyond the newcomers who arrived during Fetterman's tenure. They met people like James E. Kidd, who later became one of their artists-in-residence, and Tony Buba, an experimental filmmaker who has been documenting Braddock's economy since the early '70s. According to Bishop-Root, Transformazium felt "cautious and humbled" as they learned more about the town and decided that they would start by "taking a backseat on [their] own ideas," and focus on getting to know their neighbors. Accordingly, they began door-to-door canvassing to get a sense of the needs in the community. 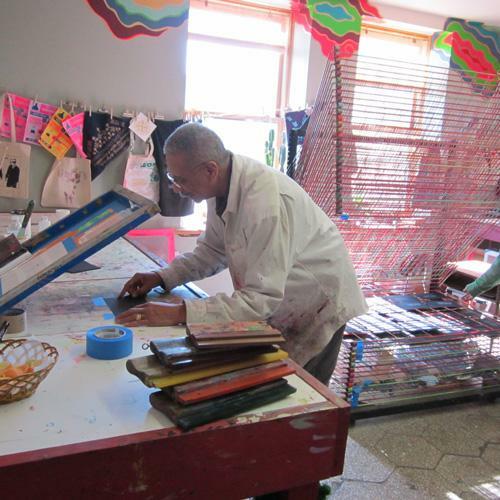 A neighbor named Mike Tobias donated screen-printing supplies, which they used to establish a print shop in the second floor of the library. Through it, Transformazium responded to the community's need for greater communication by designing wedding invites, and helping local organizations with flyers and advertising. This lead to grant-writing partnerships with the library, and eventually Ruthie Stringer found a day job as a clerk downstairs. In 2009, an official partnership began between the library and the collective to build on the positive momentum. During my tour, I was initially struck by the eroding grandeur of Carnegie's original structure. This was no mere vessel in which to house books – it originally included a music hall, a gymnasium, and even a men's bathhouse in the basement. It's tempting to assume that multifaceted, community-oriented spaces like these are relics of the past, but Transformazium and their community partners are updating the idea for the 21st century. Some of the original attributes – like the magnificent musical theater – are currently being restored to their original glory. Others are being transformed (no pun intended) to respond to contemporary needs in the community. A steel worker at the turn of the century might have come to the Carnegie library for exercise and social interaction, as well as for a book to read. Because of Transformazium's efforts, Braddock's current residents turn to it for ceramics classes, after-school programs, and even home décor. The specific needs have changed over time, but the spirit of innovation and collaboration remains consistent.